Kidney disorders may develop as a result of injury, health conditions, etc. The best way to avoid them is to live healthy and get treatments early for symptoms. The kidneys are bean-shaped organs located on each side of the spine in the middle of the back, above your waist. They play important roles in cleaning your blood of waste and excess fluids, maintaining chemical balance in the blood, and helping to regulate your blood pressure. Kidney disease may result in fluid and waste product accumulation in the body, which may lead to kidney failure. This can cause symptoms like body swelling, shortness of breath, weakness and poor sleep. Kidney problems must be treated immediately to prevent loss of function, which may be a serious, life-threatening condition. Chronic kidney disease occurs when kidney damage causes a decrease in function lasting longer than three months. Its early stage may have few or no symptoms, and it may not be noticed until significant loss of kidney function occurs. It may progressively lead to end-stage kidney failure, which will require dialysis or kidney transplantation for a patient to survive. These signs and symptoms are nonspecific and they may also be caused by other conditions. Furthermore, these may not appear until irreversible kidney damage has occurred. Cancer of the kidneys can affect the tiny tubules inside the kidneys. Your risk of developing this disease increases as you age. Other risk factors involved are genetic factors, smoking, and chronic abuse of pain medicines. Early stages of kidney cancer may have no symptoms, but during later stages, these may manifest as a lump in the abdomen, blood in the urine, unexplained weight loss, chronic pain in the side, loss of appetite. Treatments include surgery, radiation, chemotherapy, biologic therapy and targeted therapy. Polycystic kidney disease tends to run in families. Cysts take over normal tissues and cause the kidneys to enlarge and work poorly. This eventually leads to kidney failure. Cysts may also form in the liver and other parts of the body. Symptoms include pain in the sides and back, headache, bloody urine, and urinary tract infections. Diagnosis is made by getting a family history and taking imaging tests. Treatments include special medications, dialysis, or kidney transplant. Acquired cystic kidney disease is common in patients who are on dialysis. 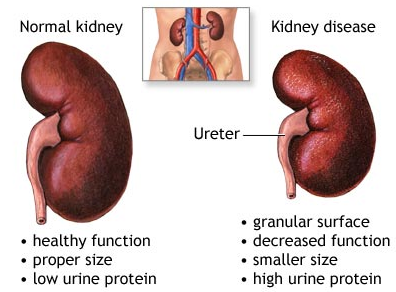 Unlike polycystic kidney disease, your kidneys are of normal size and cysts are not found in other parts of the body. Cysts develop after chronic kidney disease sets in. It is often harmless and needs no treatment. Kidney stones are solid pieces of material that form in the kidney. They may be small or large, but most of them pass out of the body naturally. However, sometimes they may get stuck and block urine flow, causing great pain. Immediate treatment is needed if you experience symptoms such as extreme pain in the back or side, bloody urine, fever, chills, vomiting, cloudy, foul-smelling urine, and pain on urination. Tests for kidney stones may include blood tests, urine examination, and imaging tests. Treatments include endoscopic surgery, shock wave treatment, or open surgery. Women are more likely to get kidney infections. Other risk factors include diabetes, having a catheter to drain the bladder, or spinal cord injury. Consult your doctor for proper diagnosis and treatment. Treatment usually consists of antibiotics. Your doctor may run tests to find out if you have kidney disease. If you have kidney failure, dialysis or a kidney transplant can replace your kidneys' normal function. Get medical treatment for high blood pressure. Control blood glucose levels if you have diabetes. Take medications to lower cholesterol levels. Eat a healthy diet with low salt intake. Be careful about your consumption of coffee, sugar, chocolate, and stimulants. Avoid taking pasteurized fruit juices, except cranberry juice (unsweetened), which may be beneficial for your kidneys. Strengthen your kidney function with homemade bone stocks made from grass-fed animals. Drink 8 to10 glasses of water daily. On winter months, you may slightly increase your intake of oil and sea salt. Include wild caught fish, sea salt, and sea vegetables in your diet. It is believed that fear is the emotion associated with the kidneys. Use meditation to calm your fears to avoid kidney problems. What Are the Symptoms of UTI and How to Treat It? The urinary tract infection symptoms may be different based on parts of UTI and different groups. Know how to treat it no matter what the cause is. Why am I Peeing So Much Before Bed? Why Does Your Urine Become Foamy?